With having a large family of younger children I’m always on the hunt for great children’s books to help bring God’s word to their hearts. 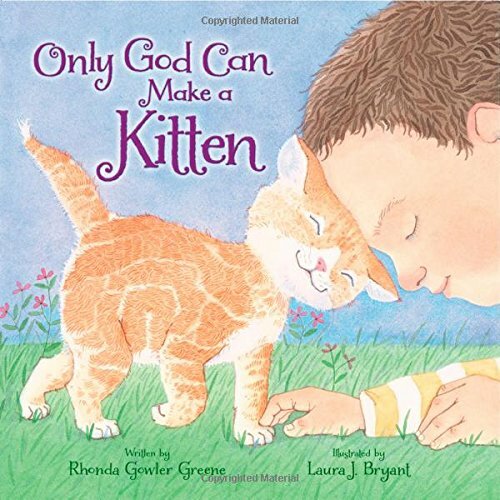 So I was really glad to have the opportunity to receive the children's book Only God Can Make a Kitten written by Rhonda Gowler Greene and illustrated by Laura J. Bryant. He often says “Mamma, look!” then describes what he’s looking at and asks who makes it make that sound. His mother answers him that only God can make the rain, rocks, trees and everything they see. Who made our hungry chirp-chirp! guests? The illustrations are beautiful sweet but simple and there is action in every scene. There is always something interesting for little ones to look at! Mother and her son are out exploring in the rain, picking plums, finding birds etc. This is a great book that would be a great nature study introduction for young children. It really points out that everything in nature around us was created by God. I love that it uses a sweet rhyme to show specific examples of God’s creation to children. This is an often requested bedtime storybook from my younger children!